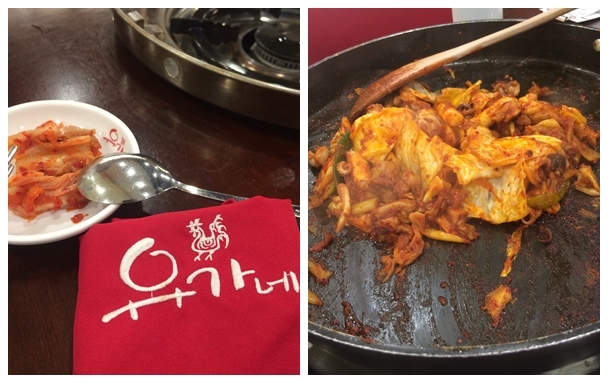 Yoogane Singapore opened with much fan-fare, touted as one of the best chicken galbi restaurant in Korea. Snaking long queues were a common sight at the Bugis Junction outlet during dinner time. But I was surprised that there was no queue at all during lunch time when we visited. Had the Octopus and Chicken Galbi with rice cake. What I liked was the table-side service of helping guests cook the dish, provided us with the apron to prevent the gravy from splattering onto our clothes and the ventilation was quite good – no greasy smell on clothes after we finish our meal. This entry was posted in Casual, Korean, Singapore and tagged Bugis Junction, Chicken Galbi, Singapore, Yoogane, Yoogane Singapore. Bookmark the permalink.